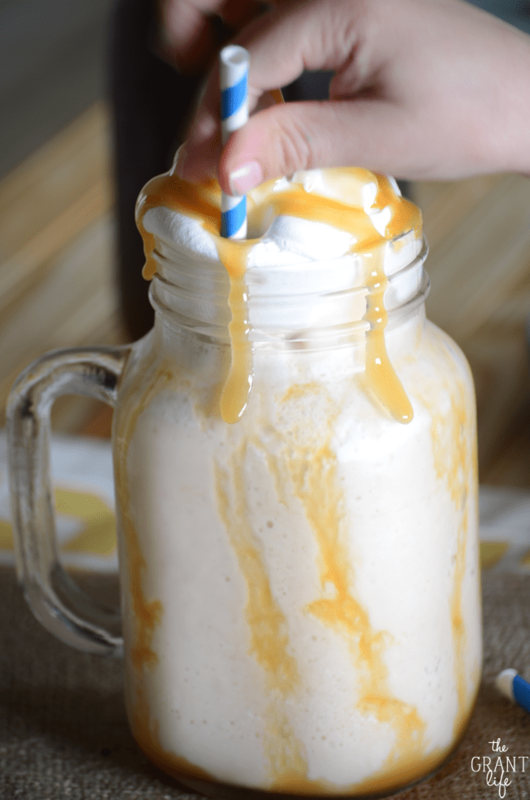 Perfectly blended, this frozen chai latte may be your new go-to drink! Last week Ryon’s younger brother and family drove down here to South Texas to visit us. From Michigan. With their two kids. They went from 30 degree temperatures to 8- plus degree temps. And they have been loving it. And we have loved having them here! We spent the whole first day they were down at the beach. And again yesterday. And we may try to go one more time before they leave. They might not have a good time, but they will go back home tan. I’m totally kidding. They are having a great time so far. Our kiddos get along like they are long lost siblings. So they get along for 15 seconds and then fight for 10 minutes. But seriously, they get along so well. My nephew is 6 months younger then Ryley and my niece is about a year younger then Avery. And man are they both stinkin adorable! The little one loves to give me cuddles and I am eating it! We have also gone to the aquarium, the Lexington museum, Brewster Street ice house and had Avery’s birthday party. [We threw his party 2 weeks early so he could celebrate with his cousins. I’ll share more about his party later.] Ohhh! And we also took all 4 kids to play mini golf. Just my sister-in-law and myself and four kids. And gold clubs. And a course that has a huge waterfall and rocks. It was super fun/beyond scary at the same time. But everyone loved it and no one got hurt. And we all got ice cream after to maybe settle our nerves. Tomorrow we are heading to San Antonio to visit the Alamo and do the Riverwalk. And find somewhere awesome to eat. We have been trying to make sure that we only eat out at local places since they are down. Well, local plus Whataburger. Because Whataburger is delicious and it’s state local. That totally counts, right? And my brother in law wins brother in law of the year for watching all four kids by himself so that the girls could do some shopping. We headed to Joanns and browsed the aisles WITHOUT SOMEONE YELLING or THROWING THINGS IN THE CART or HAVING TO PEE TWICE. And we even rewarded our good behavior with Starbucks. I like having family in town. 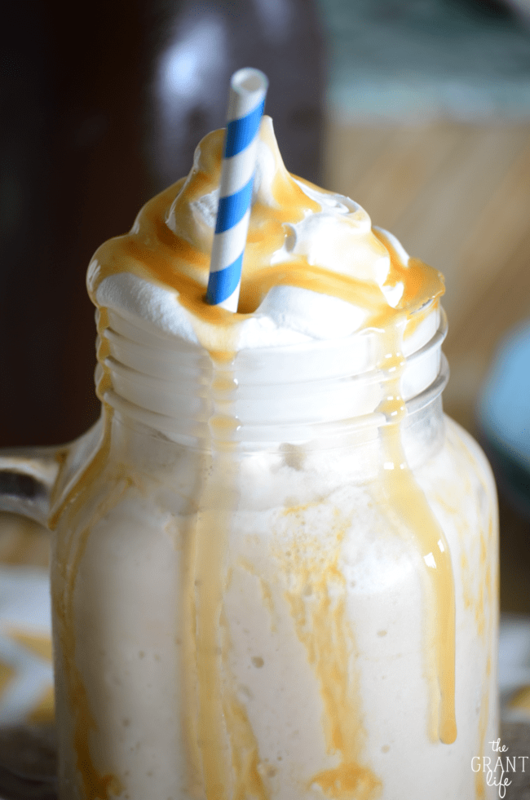 Toss everything in a blender (except the caramel and whipped cream). 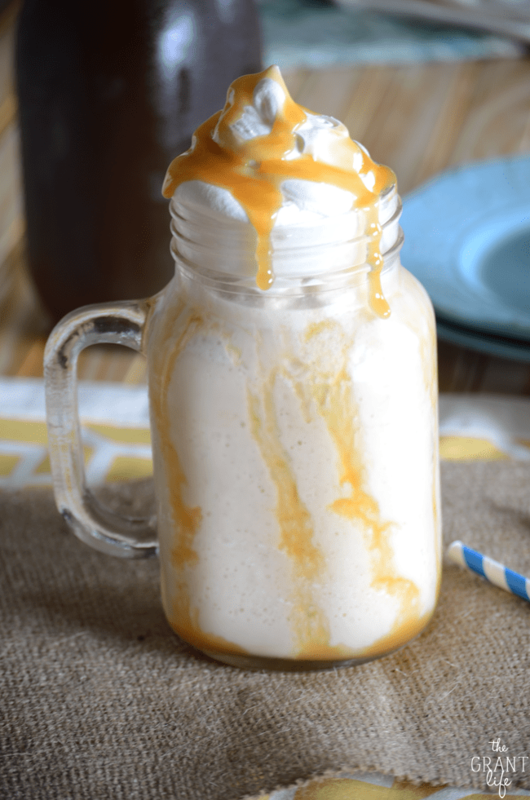 Top with caramel and whipped cream and enjoy! 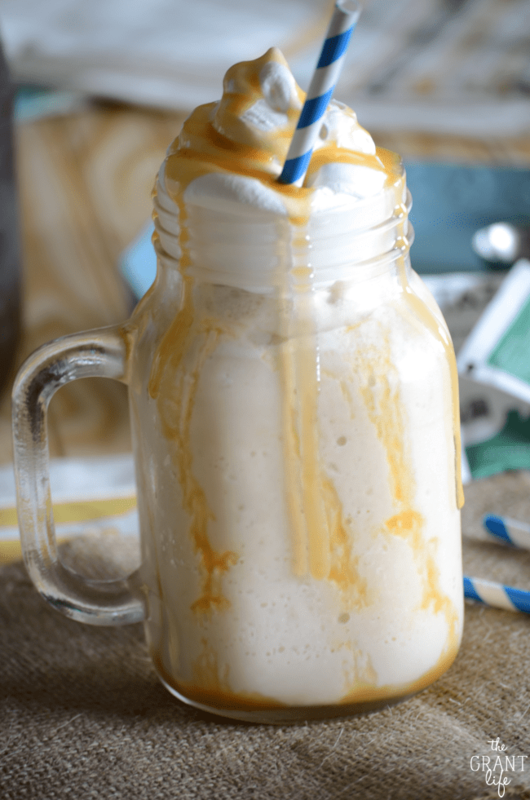 Frozen chai latte is the perfect way to start the day! I love to make soups. One-pot meals are the best! 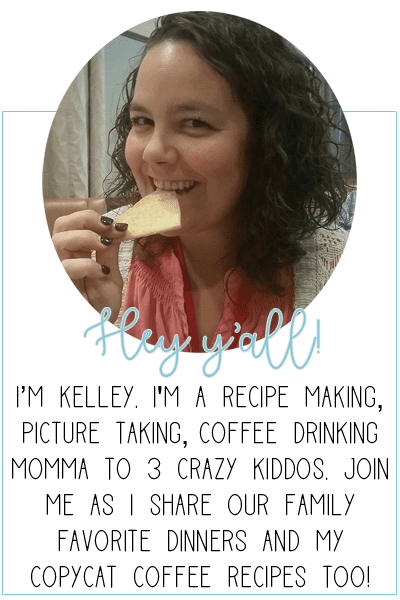 Thanks for sharing your yummy drink recipe and thanks for the giveaway! I love Chai Latte’s!! I can’t wait to try this recipe!! Hope you have fun at the Alamo. In the courtyard of the Alamo, there is a Mexican restaurant that is pretty good, but this was 8 years ago so I’m not for sure if it is still there. Have a great time!! I didn’t see the restaurant yesterday. Maybe they moved it? The Alamo was fun though! So was the riverwalk! I love to cook Mexican food. Love this recipe – I start every day with chai tea – Bengal Spice from Celestial Seasons and I can’t wait until it is warm enough up here in Washington to make this for myself. Hmmm, I believe it will be warm enough tomorrow!!! What kind of chai tea did you use, chai tea powder or loose leaf? I used chai tea bags to brew some chai tea. I normally have the concentrate in my fridge so I used that. 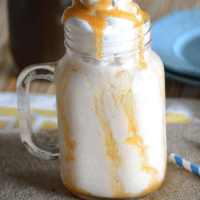 I’ve been looking for a blended chai tea latte, and I will definitely try this one! It looks so good and so easy! Thanks for sharing! And your family sounds adorable! Thank you so much Kristy! I hope you enjoy!